Turkmenistan managed to avert the loss of one of its only two buyers of natural gas with some desperate, last-gasp negotiations, media reports said. According to a report by IFP, Turkmenistan signed a new gas deal with Iran despite demands from Ashgabat for Tehran to pay $1.8 billion in alleged unpaid arrears for previous gas deliveries. Negotiations went right down to the wire, as Mehr news agency revealed. “Due to Turkmens’ persistence on [threatening to] cutting gas exports to Iran over claims of a $2 billion debt, the Iranian delegation left the negotiating table to return home. At the airport, Turkmenistan’s officials persuaded the Iranian delegation to come back to the negotiating table in hopes for reaching an agreement on gas delivery to Iran,” the news agency reported. In the run-up to the agreement, a senior official with the National Iranian Gas Company (NIGC) signalled that Tehran was willing to adopt an intransigent position over the matter, leaving Turkmenistan with few options ahead of a Saturday deadline. Earlier, a top energy official had noted there is no difficulty in meeting the demand for natural gas in the northern regions this winter, playing down concerns over a shortage of gas for heating homes and for power plants after Turkmenistan said this week it may unilaterally terminate its gas export contract with Iran. “Turkmenistan has threatened to cut gas supplies over unpaid dues for the gas it sold to Iran during the tenure of the previous Iranian government. But we won’t allow a gas crisis in the northern provinces,” Hamidreza Araqi, the managing director of National Iranian Gas Company (NIGC) said, ISNA reported. “We will reassess our trade relations with Turkmenistan if they suspend gas exports. They will eventually suffer (economically),” said Araqi, who was in Ashgabat to discuss and settle the dispute. Iran may expedite the construction of gas infrastructure from the south to the north in the face of a supply cut in Turkmen gas. Demand for natural gas significantly rose in Iran in 2007 as the country was gripped by unseasonably cold temperatures that year. Taking advantage of the conundrum, Turkmenistan jacked up the price of gas it sold to Iran from $40 per 1,000 cubic meters to $360. The government of former president Mahmoud Ahmadinejad capitulated to the price hike for obvious reasons. But the incumbent administration says the agreement was unreasonable and unacceptable and called for international arbitration, according to state news agency IRNA. Araqi says Turkmenistan has been fully remunerated for its gas supplies over the past three years, adding that “other debts should be re-evaluated”. Iran’s daily gas consumption in winter is around 700 million cubic meters, some two-thirds of which comes from the giant South Pars Gas Field in the Persian Gulf. 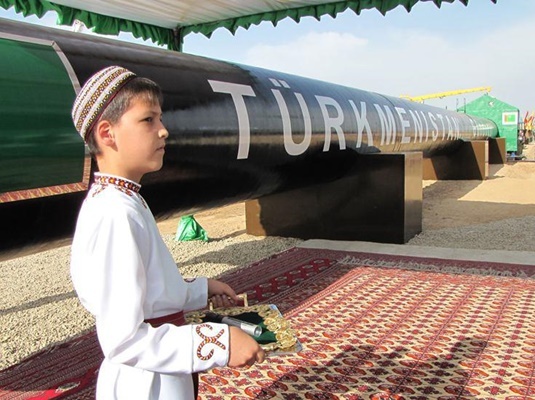 The country also imports around 12 million cubic meters of gas per day from Turkmenistan to meet part of its demand in the northern regions. Araqi said that Iran may expedite the construction of gas infrastructure from the south to the north in the face of a supply cut in Turkmen gas, Financial Tribune reported. “Our gas intake from Turkmenistan is insignificant. Nevertheless it provides part of our needs in the north. We have the capacity to raise imports (from Turkmenistan) and will try to settle the issue in a way that serves the interests of both countries,” the senior gas official said without elaboration.